Perkie's Observations: Robin is Back on General Hospital! Brad tells everyone that he’s there about the baby. He’s trying to right a wrong. Spinelli tries to stop him from saying anything. Nikolas claims no one wants to hear anything from him. Brad tells them that the baby is not Lulu and Dante’s, but Maxie and Spinelli’s. Lulu explains that Maxie was only a surrogate, but Brad says he heard Spixie say that no one would ever know. Lulu confronts Maxie and Spinelli. Luke finds himself face to face with Jerry, who realizes that Luke is in search of the cure. Jerry explains his connection to Dr. Olbrecht, Faison and how Dr. O found him a doctor to make the cure. Luke asks about the doctor. Jerry says he can’t share the cure with Luke, because there’s only enough for him. 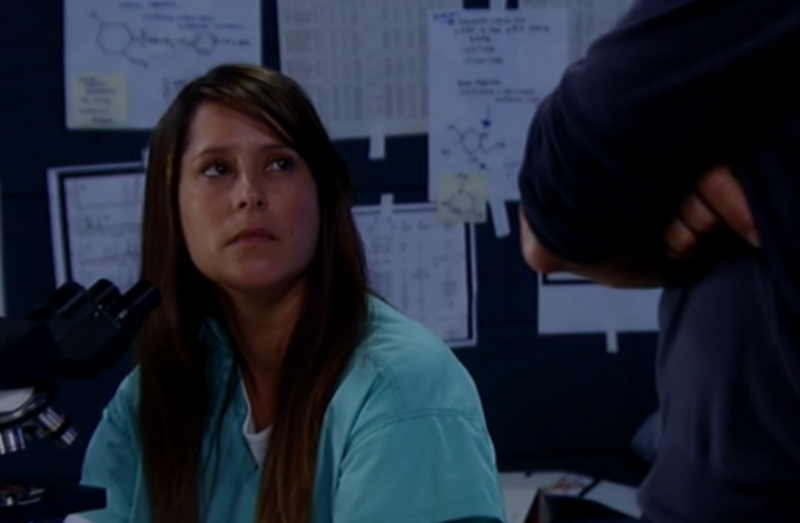 Anna tells Patrick that she’s still searching for Dr. Olbrecht. Patrick tells her what happened with Britt and that he’s not the baby’s father. Patrick explains how Sabrina’s ex showed up in town and that Carlos’ pushed his buttons about wearing his wedding ring. Anna asks why he’s still wearing it. Anna tells him he’ll always love Robin, but that he has a new relationship and Robin would want him to be happy. Britt finds her mother with Ben. Dr. Olbrecht says she came to see her son, but gets angry when Britt tells her the baby’s name. Britt mentions Nikolas. Dr. O. thinks that will make Patrick jealous, but Britt tells her that she told Patrick the truth about the baby’s paternity. Britt stops her mother from slapping her and tells her to stay out of her life and to get out. Sabrina accuses Felix of mooning over Brad. Felix tells her of Brad’s plan to do the right thing, but he has no idea what that is. Sabrina tells him about Carlos and about Patrick still wearing his ring. Sabrina admits that it bothers her and wonders if Patrick will ever love her enough to move on from Robin. Dante questions why Brad would lie. Maxie claims Brad is always lying and swears she never said what Brad said he heard. Brad points out that he has no reason to lie and storms off. Lulu refuses to believe it, but Dante feels Brad sounded coherent. Dante asks Spin about the fight he had with Ellie about “his” baby. Spin claims it was the hypothetical baby he and Ellie are planning. Nikolas points out that he saw an upset Spin watching the baby. Lulu begins to remember when Maxie wanted to tell them something. Maxie begs them all to let this go and Lulu realizes that the baby is Maxie’s. Nik gets home and finds Britt passed out on the floor. Jerry checks in with the doctor working on his cure. It’s Robin!